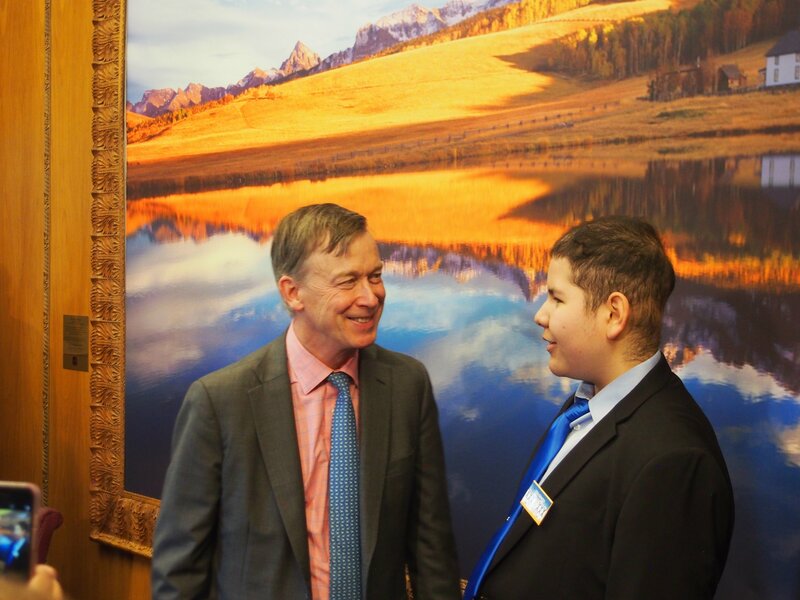 Gabriel Santistevan is a 14-year-old brain tumor survivor from Aurora, Colorado. When Gabe was just nine years old, he was diagnosed with Stage IV Medulloblastoma that had already spread to his spine. Gabe had emergency surgery to relieve the pressure in his brain and remove a portion of the tumor for biopsy. He then endured radiation every day for 6 weeks, as well as 6 months of high dose chemotherapy. Gabe will soon be 15 and though he has no evidence of cancer in his body, he will deal with side effects from his treatment for the rest of his life and will have scans every few months to confirm the cancer has not returned. 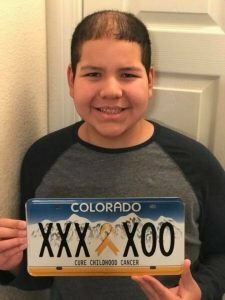 Of course, his mother promised him she would do everything she could to create a license plate to promote childhood cancer awareness and together, they have done just that! 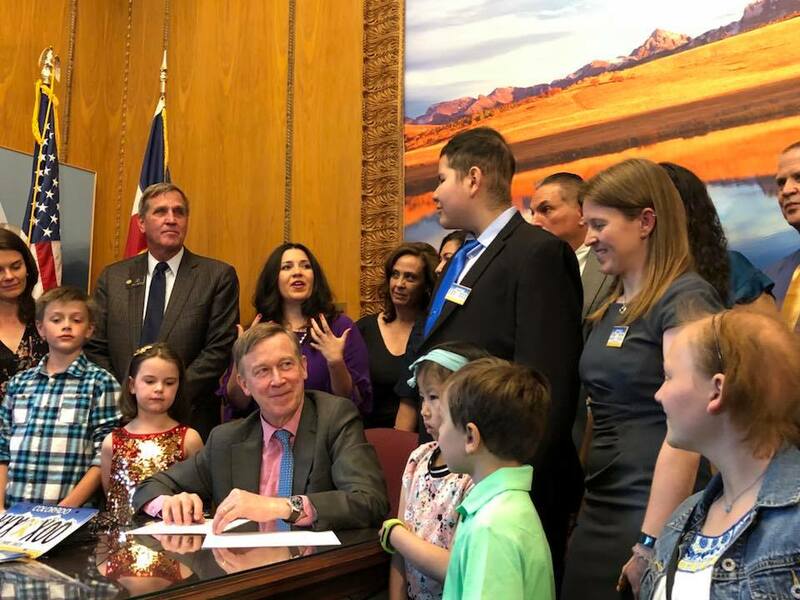 After more than a year of petitions, legislative hearings, and votes by the Colorado Senate and House of Representatives, Governor John Hickenlooper signed Colorado HB18-1255 into law on May 22, 2018! Gabe completed his treatment in June of 2014 and is now CANCER-FREE! He is thrilled to see his vision become reality and can’t wait to show kids and young adults battling cancer that they are not alone or ignored. 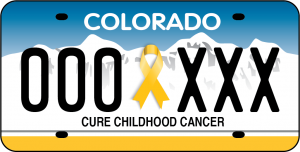 What is the Childhood Cancer Awareness License Plate? 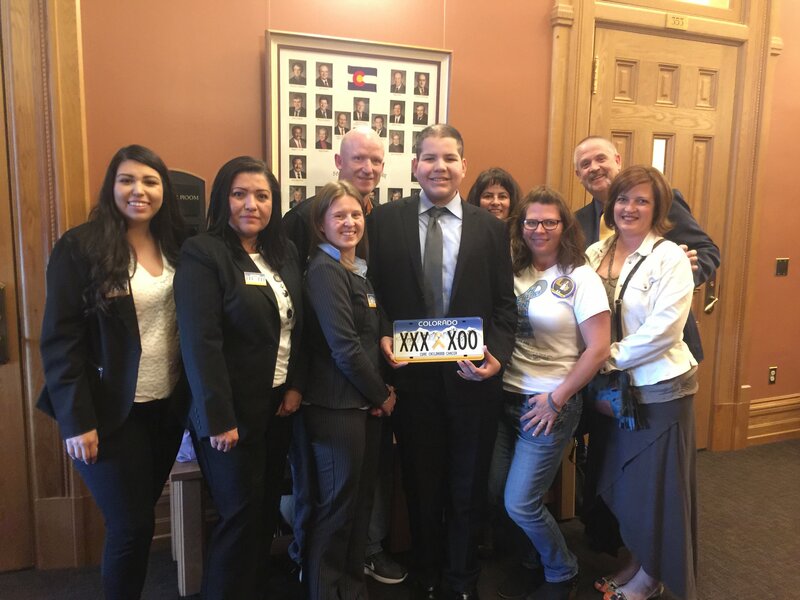 The Colorado Childhood Cancer Awareness license plate is a Colorado Group Special license plate that creates awareness for childhood cancer and shows kids, teens, and young adults battling cancer that they are not alone in their fight. Proceeds from the license plate will benefit two local nonprofit organizations that are helping in the fight against kids’ cancer: The Morgan Adams Foundation and Cops Fighting Cancer. How do I get a Childhood Cancer Awareness License Plate? Make a dedicated minimum donation of $43 to The Morgan Adams Foundation. The Morgan Adams Foundation will provide you with proof of eligibility. Bring your proof of eligibility to your local Division of Motor Vehicles office. At the DMV, you will need to pay your vehicle’s registration costs, plus a one-time fee of $50 (standard fee for any Colorado specialty plate) to the Colorado Department of Revenue. 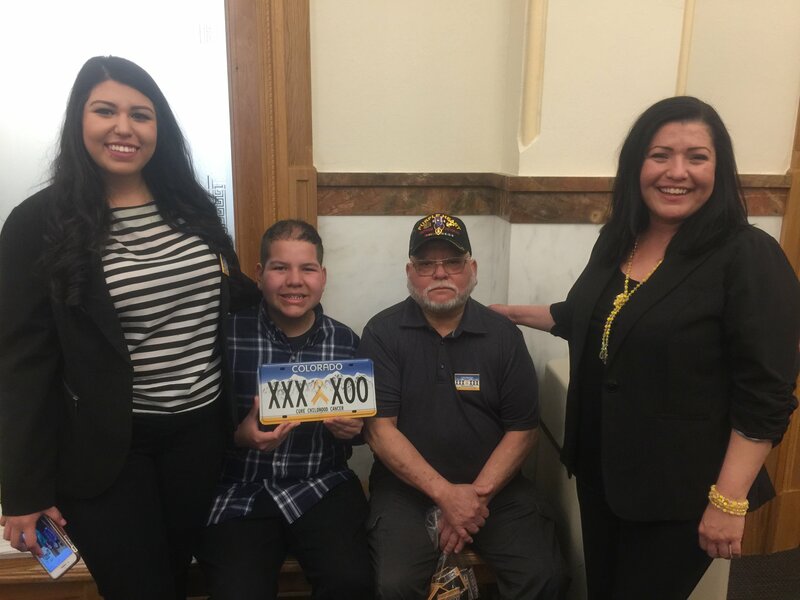 Colorado specialty plates are printed “on-demand” – your new license plates will be mailed to you within a few weeks. Every day, 43 children are diagnosed with cancer in the United States. Cancer is the leading cause of death by disease for kids under age 20 in the U.S. Read more childhood cancer statistics.